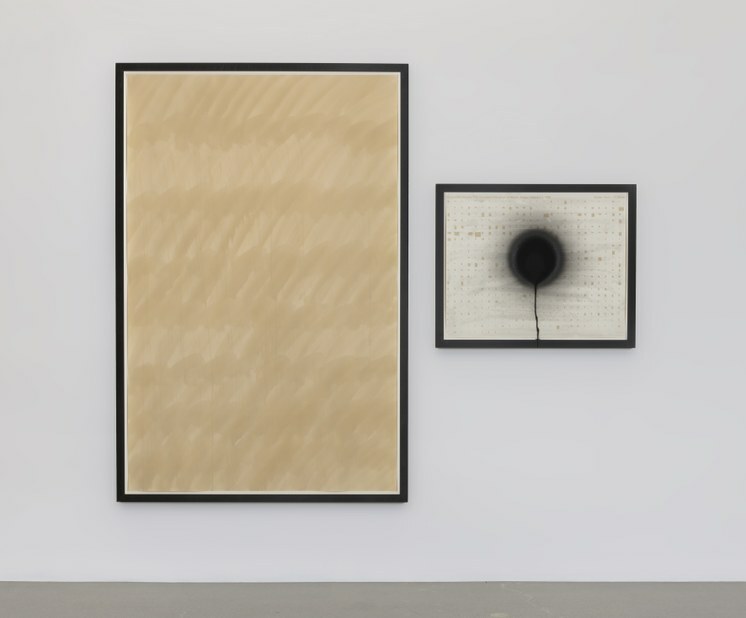 Stephen Prina is a key figure, a star in the constellation of second generation Conceptual artists to emerge from Cal Arts and the tutelage of Michael Asher. Well-read, erudite, able to operate in the realm of performance, music, sculpture and publications, Prina has exhibited at prestigious galleries and museums world wide. 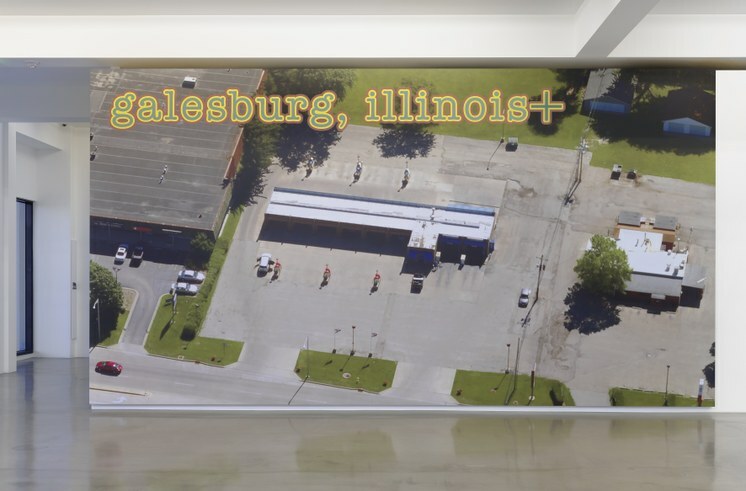 Now a professor at Harvard, he might be the last person I would think of to make art about his hometown of Galesburg, Illinois. Yet, that is precisely the subject of his show at Spruth Magers Gallery in the mid-Wilshire district, across from LACMA. Michael Asher was known for his socratic approach to teaching, holding lengthy seminars for his Cal Arts graduate students that encouraged them to think as much about why as how and what they were producing as artists. One of Prina’s best known and ongoing series involves reproducing every painting made by the 19th century French artist Edouard Manet though each result is a monochrome watercolor, painted by him in tones of pale tea but without visual reference to the original subject matter. Several from that series are on view. Mostly, however, this show is devoted to the small town where Prina was raised as the son of Italian immigrant parents. 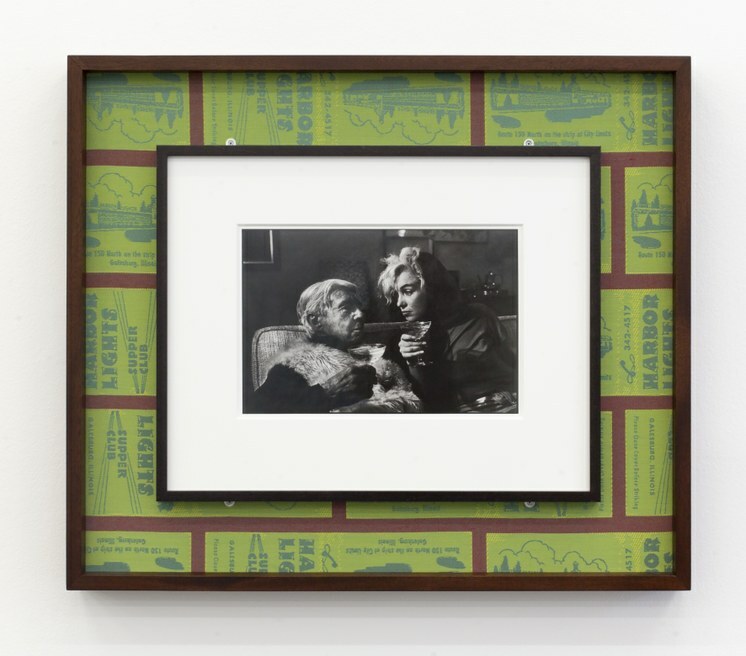 In recent years, Prina became fascinated by the unpredictable layering of personal and general histories. Galesburg was the 19th-century locus of a number of railways and attracted Italian immigrants willing to work there. His father eventually prospered to the point of being able to open his own grocery store in the small town. Galesburg has a place in American history as the site of the Lincoln-Douglas debate at Knox College, where Prina attended classes. In a manner typical of Prina’s approach, “Galesburg, Illinois+,” as the show is titled, manages to incorporate incongruous references to notable figures who were also born in the town including Lincoln biographer Carl Sandburg and Surrealist artist Dorothea Tanning. 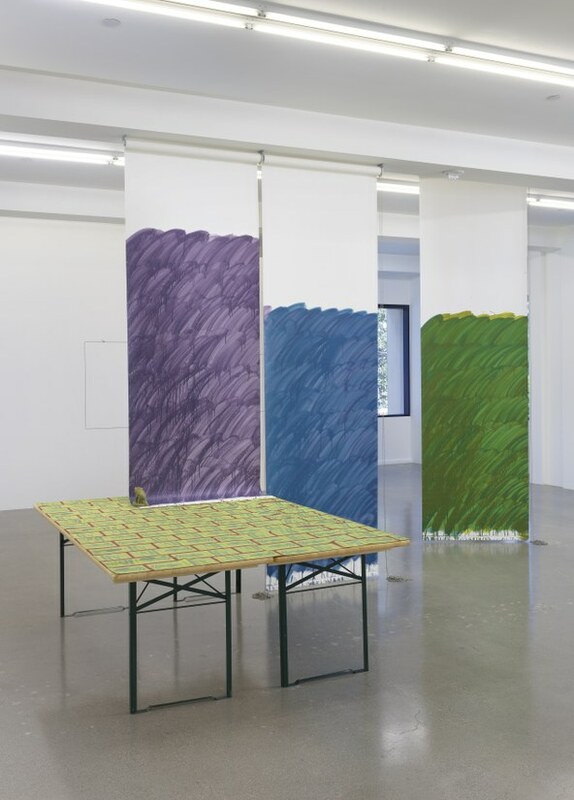 But the principle motif running throughout the show is his recreation of lime green upholstery fabric from the booths of the Harbor Lights Supper Club of Galesburg where Prina played guitar with Jeannie and the Aladdins, performing light rock songs to make money for graduate school. Prina uses this upholstery fabric as an improbable Proustian key to a past continually unfolding in his memory and in real time. The garish fabric is on a vitrine supporting a complete set of Sandburg’s Lincoln biography. 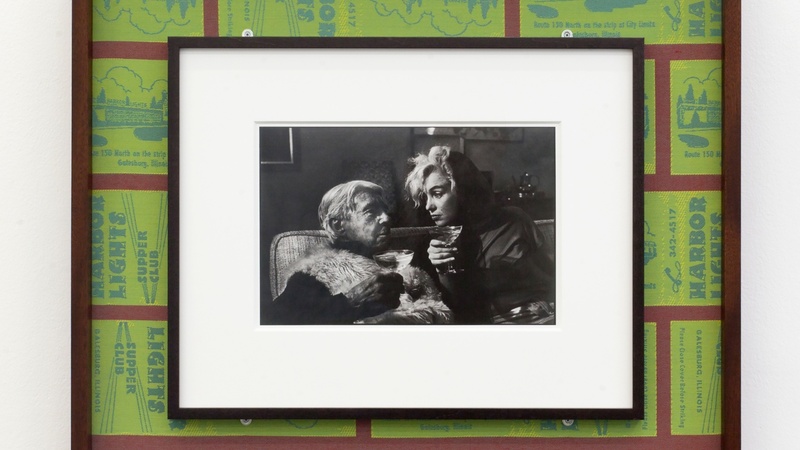 Prina uses it as part of the frame around a black and white photograph of Sandburg posing with Marilyn Monroe, which was taken by Arnold Newman. That upholstery fabric is integral to a wall sculpture of speakers playing Prina as he sings covers of various songs, some from the American folk tradition that interested Sandburg. And, there is Push Comes to Love, his ongoing project of spraying black spray paint as a circle, sometimes using an entire can so that it drips onto the gallery floor. Each piece by Prina is meticulously considered, fabricated and installed to that it references to multiple levels of past and present, personal and universal, American and International. This incorporates the actual gallery design. The last show at Spruth Magers was by Robert Irwin, who had removed panels that were blocking windows from the view of Wilshire Boulevard. By retaining that arrangement, Prina draws attention to the inherently impermanent nature of architecture, buildings ostensibly constructed to endure the passing of time. Such was the case of the storied Harbor Lights Supper Club. An aerial photograph documents the site where it stood from 1947 to 1986. Prina had that picture mounted on the sides of three city buses that now travel around L.A. advertising a once thriving place that may no longer exist but is not forgotten. The evanescence of histories is the core of his Prina’s incisive drive and insight as an artist. Prina, himself, will be performing at Spruth Magers on July 14. The show continues through August 11.